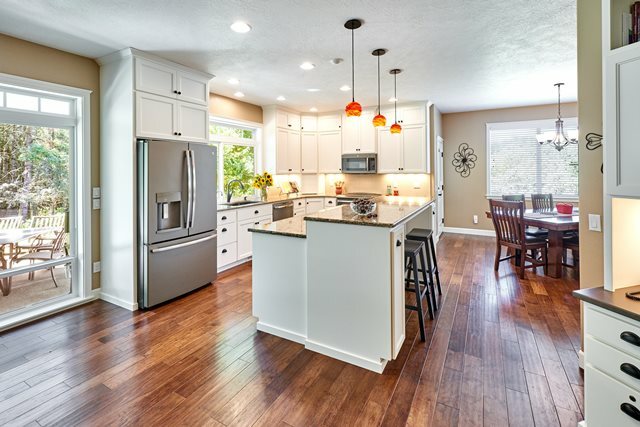 The newly remodeled kitchen is completely open to the family room. While the sink remained in the same place—saving on plumbing costs—some appliances were relocated. 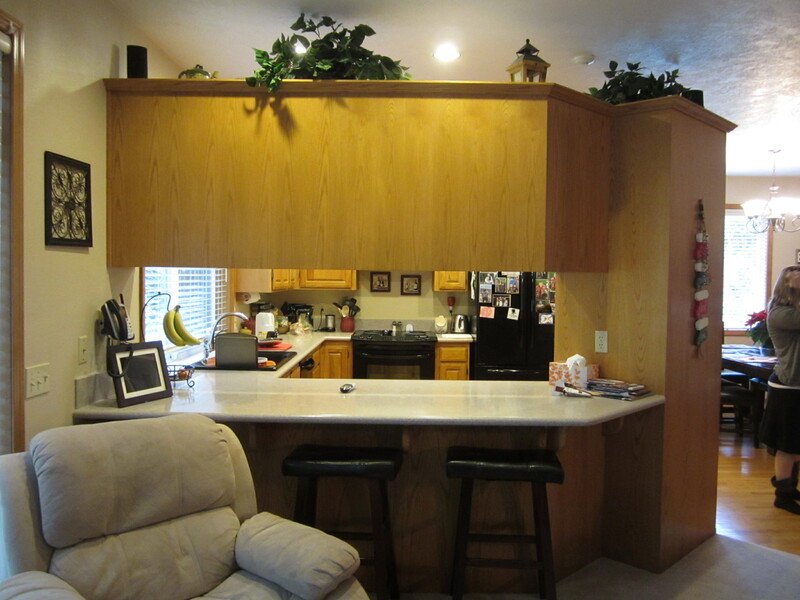 The refrigerator is now at a more convenient location for both rooms. 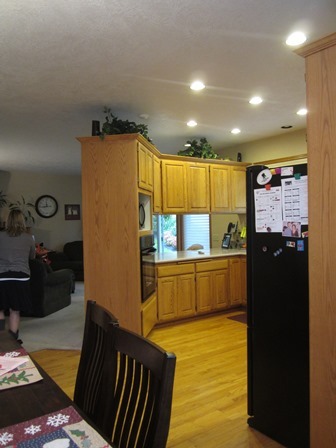 New white cabinets update and lighten the kitchen space, their full height to the ceiling providing additional storage. 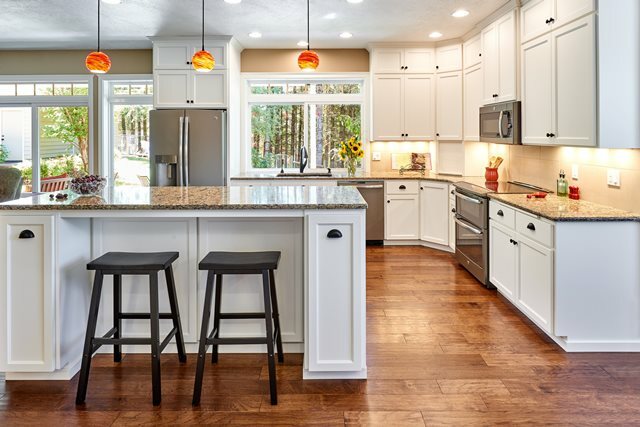 New quartz counters with an undermount sink, new faucet, and appliances all make for an elegant, fresh look for the renovated kitchen. 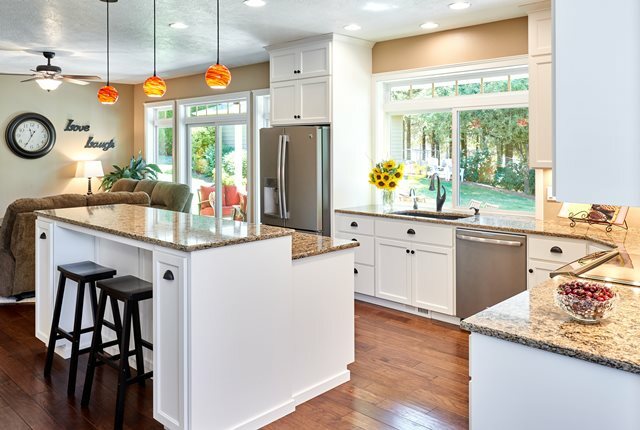 Family and guests can snack at a bar on one side of an island, illuminated by colorful decorative glass fixtures. 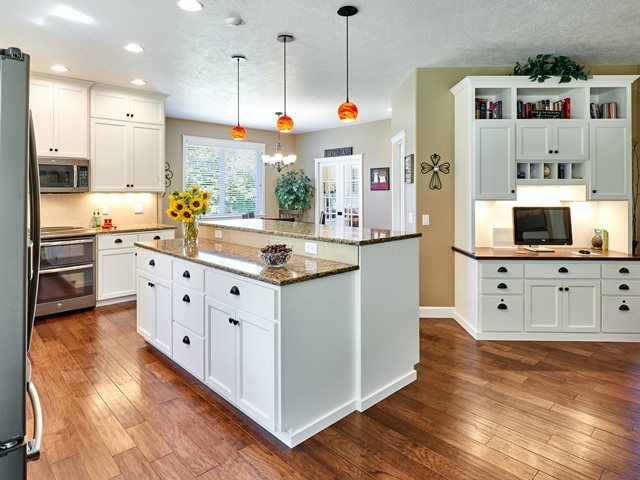 The split-level island also provides adjoining but distinct space for food preparation. 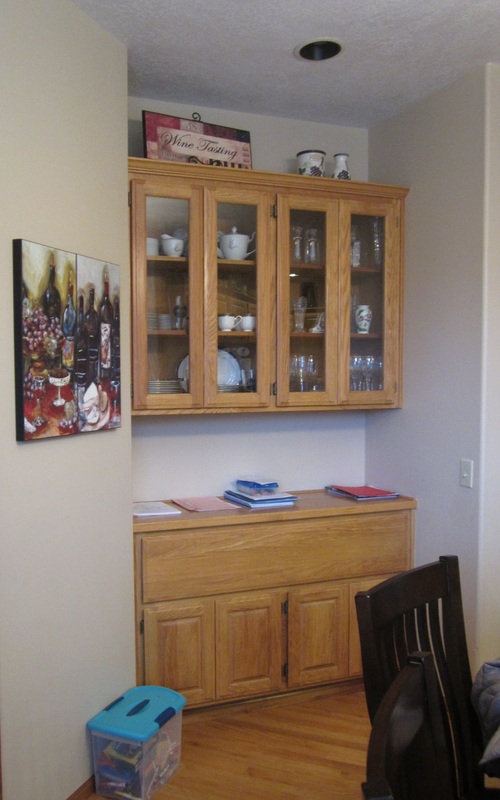 A custom desk with hutch makes organization and planning a breeze. 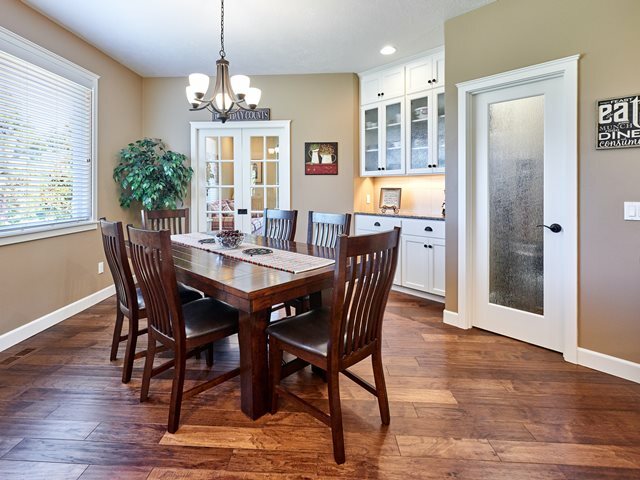 The adjacent dining area is close to the kitchen but visually distinct. Its angled orientation brings interest to the spaces. 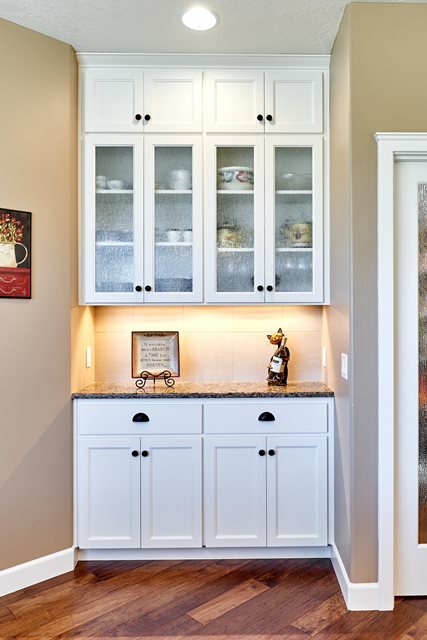 A pantry and built-in dining buffet provide additional storage. 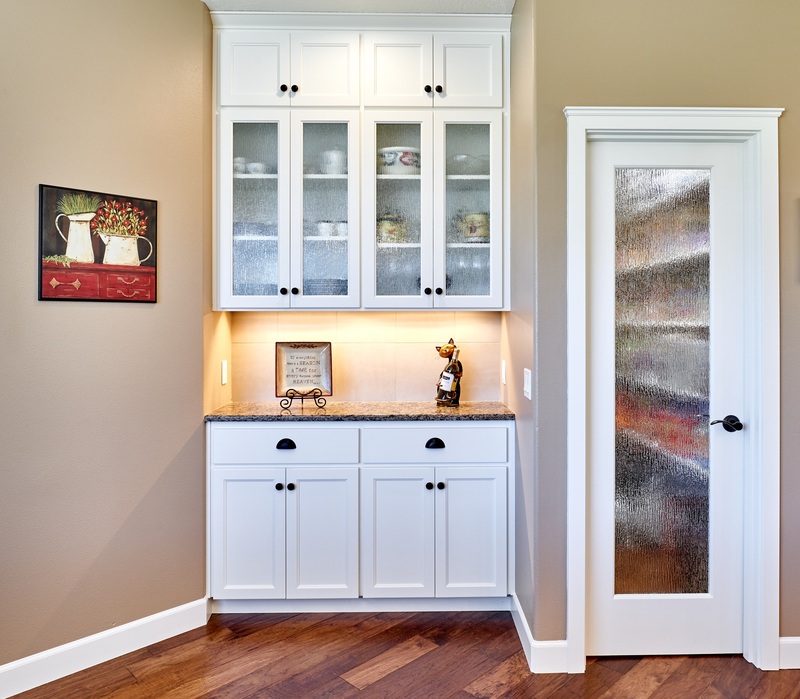 Textured glass in the pantry door and dining room buffet cabinet adds visual interest. While remodeling the kitchen and adjacent indoor spaces, we also renovated an outdoor living space, tying both together in an intimate way. 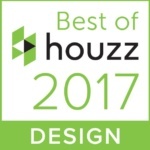 The client wanted a large outdoor living area to enjoy together—a place where they could gather for meals, barbecues, or an evening fire. This new spacious patio offers plenty of shade during hot summer days, as well as protection from rain and other inclement weather. The beautifully stained, tongue-and-groove cedar ceiling adds drama to the space, while skylights and exposed beams give an airy feeling. 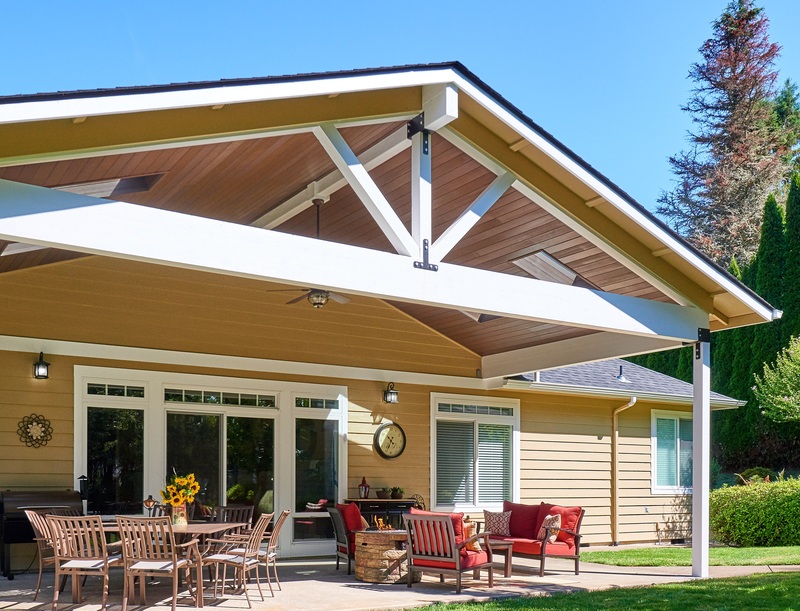 A large ceiling fan was installed to help the patio stay cool, even on the warmest days. 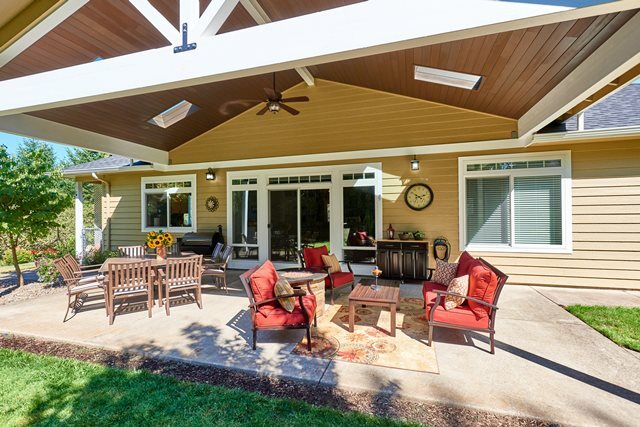 The generously sized porch accommodates outdoor grilling, dining, and seating for friends and family. A propane-fueled fire pit brings warmth on a cool evening or autumn afternoon. 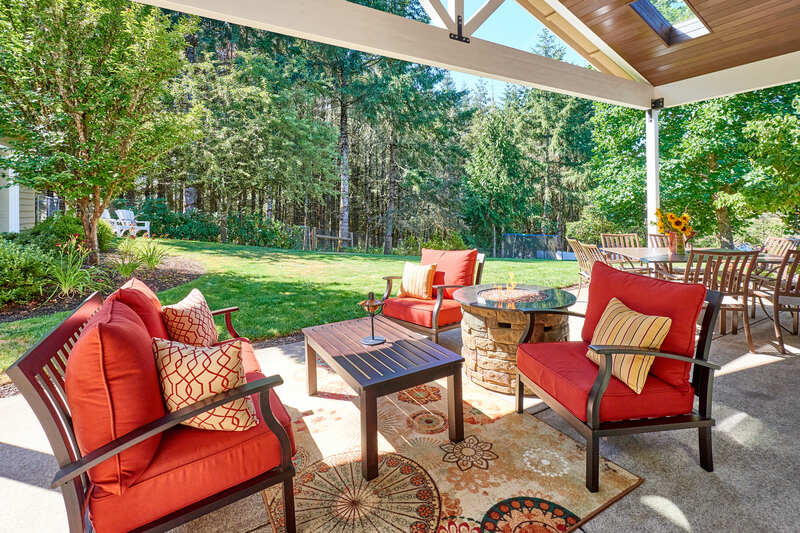 Sheltered from the rain and sun, the outdoor living room is furnished much like an interior room, complete with indoor-outdoor rugs. 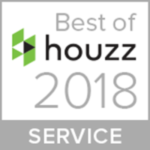 Together, the interior renovations and new outdoor living space have dramatically improved the livability of the house, while increasing its value!